While the study of 17th century tokens does not involve any special skills the subject may introduce a few basic terms which are unfamiliar to those who haven’t any previous knowledge of numismatics or this particular period in British history. Some of the nomenclature used throughout this site is listed and explained below. Alloy : Homogeneous mixture of two or more metallic elements. Common alloys used in the minting of tokens include bronze (i.e. copper and tin) and brass (i.e. copper and zinc). Blank : Prepared disk of sheet like metal on which the token design is stamped. Also called a planchet or flan. In practice, “Blank” is also referred to the un-struck or flat side of a uniface token. Brockage : Originally referring to metal wasted in coin or token production but now most commonly the term applied a tokens struck when the previous token in the minting process remains stuck to a die, creating an incuse impression in the next token struck. Device : Pattern or emblem used in the design of a token. Die : Metal block engraved (in reverse) with the design used for stamping or striking the token. 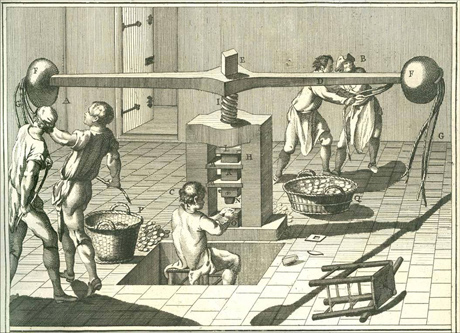 Token blanks would be placed between obverse and reverse dies and pressure applied by a coining press as part of the token minting process. Die Error/Defect or Crack : An imperfection in the token’s design caused by various sorts of damage inflicted to one or more of the dies from which it has been struck. 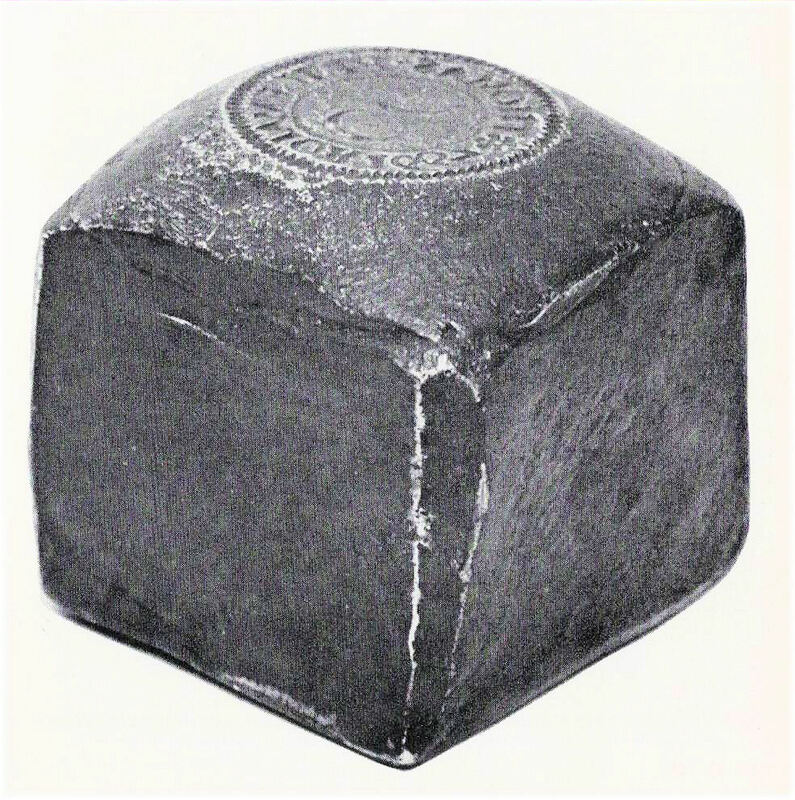 A die crack is often indicated by a raised line across the face of the token to the caused by a damaged die. Engraver : Person who cuts the image of a token’s design (in reverse) into a die. Exergue : A segment of the coin design separated by a line (usually indicating the ground in the design) in which a legend is placed/inscribed. Exonumia : A North American term having the same meaning as the British originating term paranumismatics. Field : The portion of a coin where there is no design. Usually the flat part of the token around the central design or legend on the token’s obverse or reverse. Flan : See blank or planchet. Legend : The wording which appears around the outer perimeter or in lines within the central fields of the tokens obverse and/or reverse. On 17th century tokens the legends are in Latin scrip. As such there are no Js or Us instead Is and Vs are used in their places respectively. Obverse : Apart from one or two exceptional pieces which are struck on one side only or which have both sides the same, all the 17th century tokens carry a different impression on each side, the obverse and reverse, which are the” heads” and” tails” of regal currency respectively. The obverse of the token normally contains the issuer’s name and his trade mark (a tavern sign or a simplified coat of arms of the appropriate duild to which nthe tradesman belonged or sometimes the representation of an article sold). Paranumismatics : The study of coin-like objects such as tokens, checks, passes, tallies, motties and medals, and other items used in place of legal currency or other for alternative functions or reasons etc. Planchet : See flan or blank. Press : The name given to the mechanical apparatus which holds and applies compression force to the token dies in the tokens minting process. Reverse : Apart from one or two exceptional pieces which are struck on one side only or which have both sides the same, all the 17th century tokens carry a different impression on each side, the obverse and reverse, which are the” heads” and” tails” of the regal currency respectively. The reverse normally contains the place-name (street or district) and the issuer’s initials. Triad : The name given to the set the set of three initials, arranged in an equilateral triangle, of a married couple. 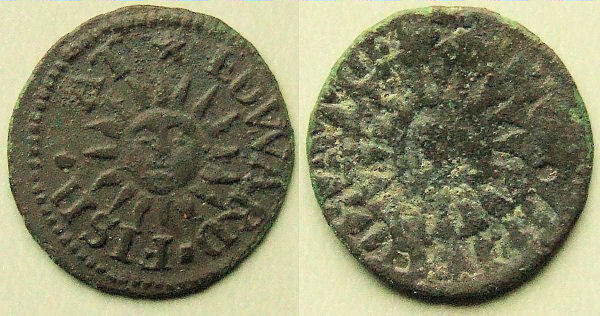 Triads often appear on the reverse side of 17th century British tokens and comprise the initial of the christian name of the husband (bottom left), his wife (top centre) and their common surname (bottom left). In addition to being found on tokens of this and slightly later periods triads can also be found on door lintels, name plaques built into building walls plus appear as a mark of ownership on furniture and cutlery etc. 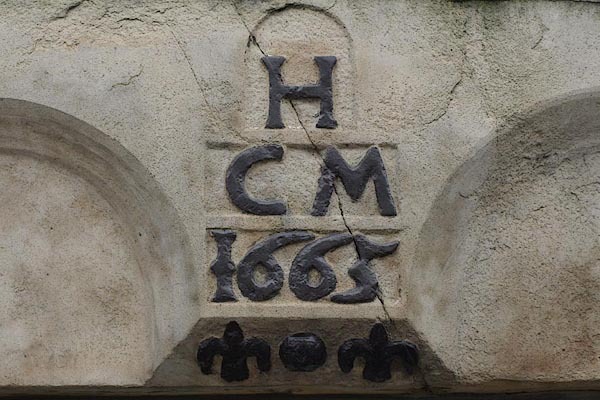 A 17th century triad incorporated into a commemorative plague carved into a stone door lintel in a building in Market Street, Lower Holker, Cumbria, England. Uniface : A token struck with the design on one side only. There only a few examples of such designs in the British 17th century token series.